Can we take Tainted Charity? Who wrote the Haggadah? I am the head administrator at a major Jewish nonprofit in New Jersey. One of our biggest donors has been charged with a crime. We want to remove his name from our building now. Do we need to wait and see if he is convicted or exonerated? It could be years and we do not want to suffer embarrassment in the interim. You do not need to wait. But you may not need to disown your disgraced donor, even when he (or she) is convicted and sent to prison. Check with your New Jersey colleagues in the nonprofit sector about the local customs in this muddy swamp. It seems obvious that where big money is involved, creative solutions abound. For instance, I can recall several years back, when a big-named donor of a New Jersey Jewish school was sent to prison. It was true that as a result, his name was removed from the school. But resourcefully, the school put up his mother’s name as the replacement. And the family continued supporting its cause. 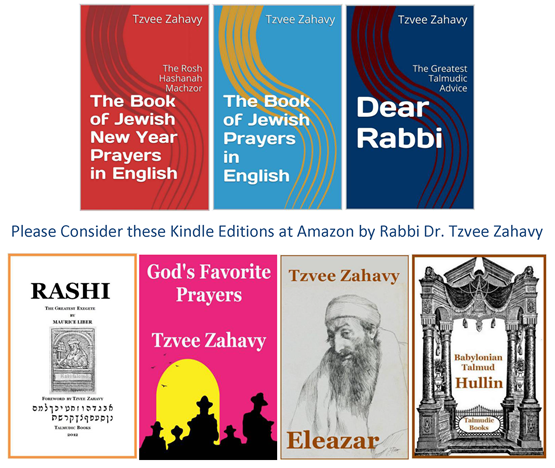 Thanks to all of you who purchased my Haggadah on Amazon. But who wrote the original text? Like all the siddur and other classic works of Judaism, the Haggadah dates back to before people started putting title pages and copyright notices on their books and listing them on Amazon. So we don’t really know. We do know that most of the text we use today is found in the earliest Jewish liturgical manuscripts, which date from the ninth century. And the outline accords with the teachings of the Mishna from six centuries earlier. But who put this together, and exactly when? Truth be told, we don’t know. Now, however, a Teaneck rabbi — and Jewish Standard columnist — has republished a classic work that highlights all the different pieces of the jigsaw puzzle. This month, Rabbi Zahavy reissued the Polychrome Historical Haggadah. Originally published in 1974, it was the work of Rabbi Jacob Freedman of Springfield, Massachusetts. 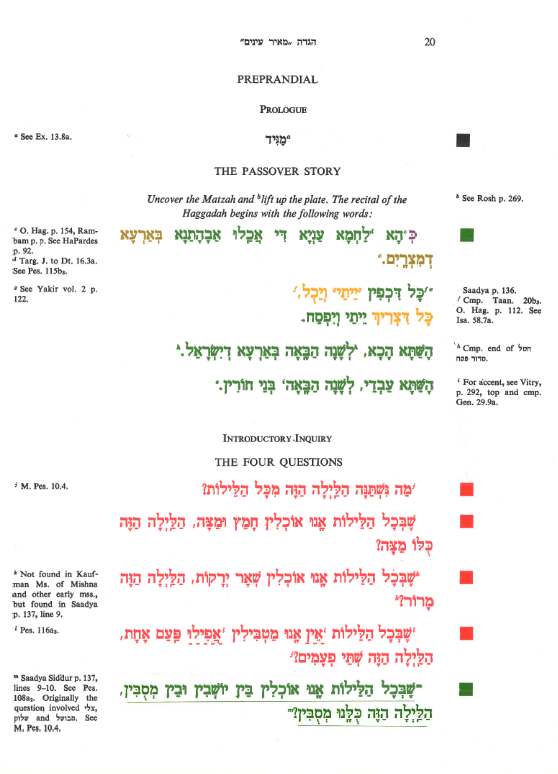 It highlights the different levels of the Haggadah by putting each stratum in a different color. Biblical verses are black. Mishna passages are red. And so on — until contemporary additions like the Hatikvah, appropriately in Israeli-flag blue. It is a seven-hued rainbow. Purim is a happy holiday and the book of Esther is great entertainment. But this short biblical book also teaches us some profound lessons about politics, bureaucrats and life. We ought to pay close attention to all its nuances and messages. This year we point out that according to the book of Esther a woman can save the Jewish people (but she cannot be counted in an Orthodox minyan - make any sense to you?). Yes, Rush Limbaugh is a Jew. 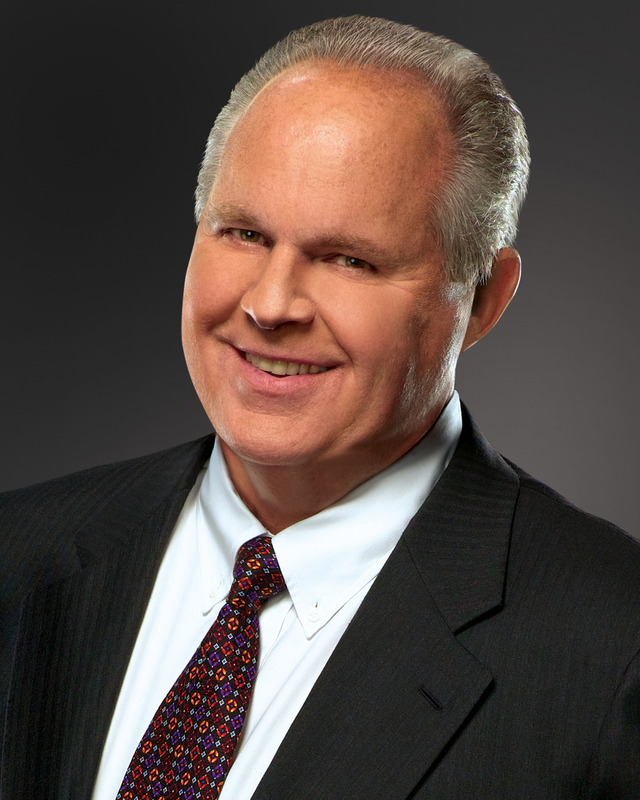 Rush's Conservative Gentile persona is a successful act that has earned him record multi-million dollar contracts in the radio business. Rush's real name is Ronald Levy. He was born on the upper West Side of Manhattan. His father was a dermatologist and his mother a junior high school librarian. He attended the Ramaz School where he excelled at floor hockey and then Amherst College where he double-majored in art history and chemistry. Rush was accepted to Albert Einstein Medical School of Yeshiva University. He had to withdraw during his first semester because he could not control his mocking derisive laughter when confronted with the illnesses and infirmities of the hospital patients. I have been bothered deeply to read and hear about a conflict among Teaneck Orthodox rabbis over the hiring of a woman in a rabbinical capacity at a local synagogue. I think our rabbis ought to set better examples in their behavior and be more progressive in their views about women. I’m sure you realize, first of all, that contention over female clergy is an issue only in the Orthodox world. The Conservative movement has counted women in the minyan for decades and ordained women starting in 1985. Reform Judaism also takes an egalitarian approach to the role of women in their communities. Its first woman rabbi was ordained in 1972. Sorry, I fear there is not much I can suggest to you to do to help resolve this Orthodox rift. And I say this not based on an assessment of the contemporary persons and institutions involved in the current spat. At first glance, that’s a good question. As you may know, that question is a popular meme in imaginative literature, drama and films, and a prominent theme in religious teachings. It’s not automatically an outlandish question. But it raises my concerns that you ask it. My first trepidation is that you ask this question because you are in a depressed or agitated disposition and looking for an escape. Take a look in the mirror. Introspect about your own state of mind. Ask people close to you if they have any concerns about your mood. Are you unhappy at work or at home? Are you facing medical challenges and seek escape from them? Are you looking for some sort of ultimate external resolutions to your problems? If you detect any of these circumstances in your life, it would be good for you to see a therapist, and not seek to calculate the number of hours left in the existence of the universe. Now it may be that you are sound in your mood levels, but perhaps you are looking around at the world and see things that genuinely trouble you, and that you feel you are powerless to control. I remember from when I was quite young that my grandmother told me one day in a calm and reassuring voice that she was sure the moshiach — the redeemer messiah that we Jews have been awaiting for millennia — soon will come to redeem us. What made her sure were the signs of the times that she detected all around us — particularly what she judged was the precipitous decline of morality among young people in our culture. End-of-days narratives come in many forms. Often, they seek to be reassuring, in a strange, unsettling way. In the genre called apocalyptic (meaning: revealing the end), the story told often relates to us that upheavals or cataclysms soon will be upon us, followed by a change in the way the world is run. After that, we powerless people, who face suffering now, soon will be in power. Sure, at this time of the new year it makes sense for a person to wax philosophical and to ask such a big question. However, let me consider that perhaps you were not really serious in sending in this question to begin with. While that may not be the momentous meaning of life, that is not bad advice. Now, let me consider the alternative, and take your question as a serious inquiry and try to reply in kind. I sit next to a person in synagogue who frequently engages me in conversation and tells me how evil Islam is. He seems preoccupied with this subject. He says Islam is a terrorist religion and he fears that all Muslims are potential terrorists. He says that sure, some members of that religion pretend to be friendly. But he claims if you turn your back on a Muslim, they will slit your throat. I know we need to be vigilant to protect ourselves against our enemies. But I feel this person has gone off the deep end and makes me more uncomfortable each time he goes on another tirade. What should I do about this? My first impulse is to smile and tell you to change your seat in synagogue. But I know that where we sit often is not easily shifted. If you move to another place, you will perhaps cause a cascading domino effect of seating shifts. And who wants to upset the equilibrium of worship? There is no Mishnah or Talmud tractate for the festival of lights. Why is that? What is Hanukkah? For our Rabbis taught: On the twenty-fifth of Kislev commence the days of Hanukkah, which are eight on which a lamentation for the dead and fasting are forbidden. For when the Greeks entered the Temple, they defiled all the oils therein, and when the Hasmonean dynasty prevailed against and defeated them, they made search and found only one cruse of oil which lay with the seal of the High Priest, but which contained sufficient for one day's lighting only; yet a miracle was wrought therein and they lit the lamp therewith for eight days. The following year these days were appointed a Festival with the recital of Hallel and thanksgiving.